South Zilker Park is the portion of Zilker Park bounded by Barton Creek to the north, Azie Morton Road to the south, Barton Hills Drive to the west, and and Barton Springs Road to the east. This area includes the south gate to Barton Springs Pool, sports fields, the Sunken Gardens, a hike-and-bike trail, as well as natural areas with native trees, flowers and grasses that are enhanced by two small waterways. Little Zilker Creek is a small channel that parallels the sidewalk on the north side of Azie Morton Road. This creek receives runoff from the Zilker and Barton Hills neighborhoods, flows over the Barton Springs recharge zone just after it crosses under Azie Morton Road, and then flows into Barton Creek a few hundred feet downstream of Barton Springs Pool. Little Zilker Creek diverts water from the Old Little Zilker channel which in years past carried stormwater directly into the Barton Springs Pool near the diving board. While technically within the Barton Hills Neighborhood boundaries, residents of both neighborhoods (Zilker and Barton Hills) benefit from this park. 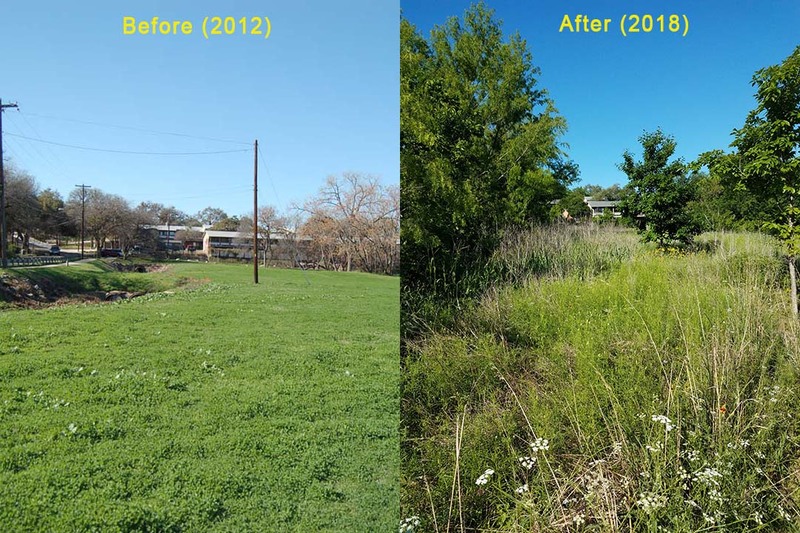 In 2014, at the request of the City’s Watershed Protection Department, a volunteer neighborhood group was formed to enhance the beauty and ecological functions of Little Zilker and Old Little Zilker Creeks, building on the “no-mow” zone established in 2012. Prior to that, the tributary was a mowed, trash-filled channel that moved stormwater from our neighborhoods into Barton Creek but provided no real ecological or aesthetic benefits. Working under watershed restoration plans approved by Watershed Protection, residents of Zilker and Barton Hills neighborhoods work to control invasive species; plant and protect native trees, grasses, and flowers; and clean up trash in the area. Additional guidance and support are provided by the Parks and Recreation Department, Keep Austin Beautiful, Austin Parks Foundation, TreeFolks, and the Texas Conservation Corps. The restored streams filter pollutants from our neighborhoods’ storm water runoff, lessen erosion, mitigate flash flooding, and enhance wildlife habitat. "Before" and "after" photos attest to how quickly streams can be restored. In the fall of 2017, the Austin Parks Foundation awarded the Friends of South Zilker Park a Community Grant of $7,500 through the Austin City Limits Music Festival Park Grants Program. Funding was used to improve the Little Zilker Creek and Old Little Zilker Creek waterways that flow to Barton Creek. 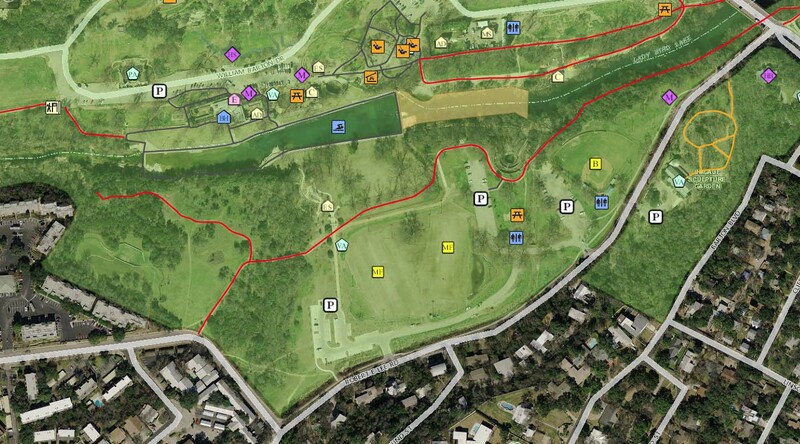 For a map and description of the improvements made to South Zilker Park, see this PDF. Volunteers have contributed over a thousand hours to the enhancement of South Zilker Park. Opportunities to participate in periodic workdays, typically held on Saturdays and some weekday mornings, are announced on the ZNA Calendar Page and Zilker listserv and in ZNA newsletters. Tools and gloves are provided. Children 13 and under must be accompanied by an adult at all times. Knowing in advance who is coming helps in planning for supplies and tools, as well as to notify volunteers if there are any last minute changes (e.g., weather-related). If you plan to volunteer, please RSVP to Gail Rothe (grothe@austin.rr.com), the ZNA Vice President of Parks and Environment. Parking Improvements - Except for the area immediately adjacent to the south entrance of Barton Springs, the parking in South Zilker Park has been largely unstructured with parking areas connected via a single park road lacking a specific traffic pattern. This has lead to illegal parking, traffic congestion, patron frustration, and lack of emergency vehicle access. In 2018, the City has proposed and implemented some improvements to this area. Read more about it in this PDF. Management of Parking Lot Runoff - The parking lot adjacent to Wright Little League Field drains directly to Little Zilker Creek and then immediately to Barton Creek. In 2019, the Parks and Recreation and the Watershed Protection Departments will install a filtration pond at the lower end of the parking lot where native vegetation will act to prevent pollutants from entering Barton Creek and Lady Bird Lake. Sunken Garden - In the late 1800’s, Old Mill Spring, also known as Zenobia Spring, was developed as a grist mill by Michael Paggi, and as a gathering place. The state's first fish hatchery was established at Sunken Gardens. The National Youth Administration began a project building a Sunken Garden surrounding Old Mill Spring in 1938. Rock walls were built around the spring and stone terraced steps were constructed within the spring leading out of the spring pool. Most of the walls are in need of repair, but the spring still flows. The lower levels are fenced and off limits today as a sanctuary for the Barton Springs Salamander and the Austin Blind Salamander, both of which are endangered species. Old Rabb House - Rubble from the old Rabb House, including what appears to be an old circular well, are still visible along one of the hiking paths. John and Mary Rabb were early settlers of Texas, arriving in 1822 as part of Stephen F. Austin’s Old Three Hundred colonists. John purchased the land surrounding Barton Springs in 1860, and the family resided in a log cabin. John died in 1861, and deeded the land to his youngest son, Gail Texas Rabb, with a provision that gave Mary possession and control of the property until the time of her death. Mary and the children continued to live and ranch at the springs. In 1867, Mary had a two-story limestone house built near the log cabin. She died in 1882, and her son Gail and his wife Isabella continued to live at the site. Over the years, various parts of the property were sold off including the main springs to Andrew Zilker in 1907. Gail Rabb died in 1929. When Isabella Rabb died in 1934, she left the Rabb homestead to her only daughter, Mayme. In 1955, the City acquired the old Rabb house and surrounding 29 acres of land on the south bank of Barton Creek. The old Rabb house had partially burned in 1943, but after the City acquired the property, the remainder of the house was burned in 1956. Old Stone Bridge - Construction of a stone bridge over Barton Creek just above Barton Springs was completed in 1889. The arch spanned 108 feet and was 26 feet in height. The following historic photos show how the bridge originally looked. In photo #1, the old Rabb house can be seen under the right side of the arch, and the old mill can be seen under the left side of the arch. In photo #2, the old Rabb house can be seen to the right of the bridge, and the old mill can be seen under the left side of the arch. Heavy rains and floods in April, 1900 washed out this bridge. Remants of the southern end of the bridge still exist today and are located in the western portion of South Zilker Park along Barton Creek. W. Jones #146 Memorial - This memorial was erected in memory of Park Police Officer William D. Jones, Sr. near the site where he was killed in the line of duty. Officer Jones was shot and killed on May 28, 2000 while conducting a traffic stop in Zilker Park. The memorial is located on the far eastern end of South Zilker Park adjacent to Azie Morton Road just southwest of the intersection with Barton Springs Road. 2011 Tree of the Year - This pecan tree was awarded the City of Austin's Tree of the Year award in 2011. It is shown on Google Maps as "The Monkey Tree" but there is no documentation as to the origin of this name.